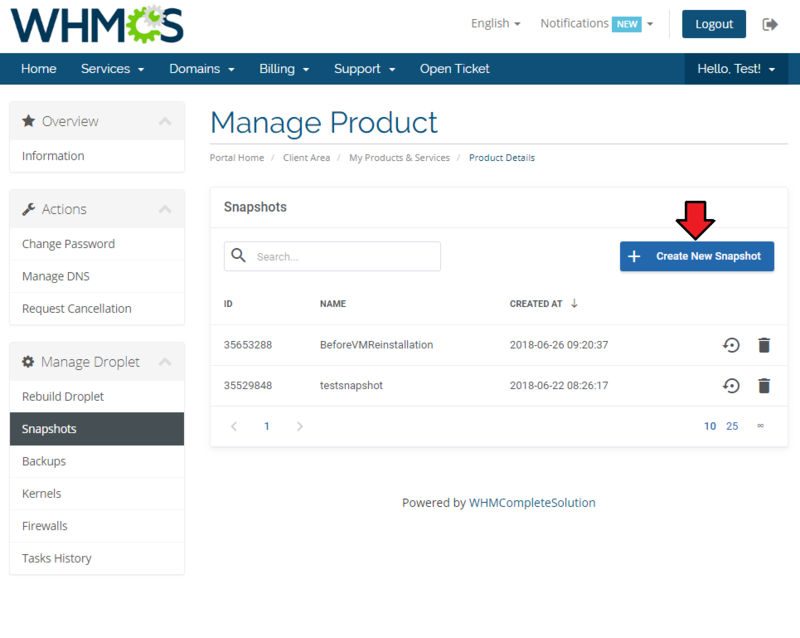 DigitalOcean Droplets For WHMCS is a tool of invaluable usefulness which will allow you to provide Droplets to your audience in a completely automated manner. The module will empower your clients to exert full control over their virtual machines through such actions as power on/off, reboot, server rebuild and many more. At the same time you will be enabled to carry out a thorough supervision of all tasks performed on virtual servers directly from the admin area. 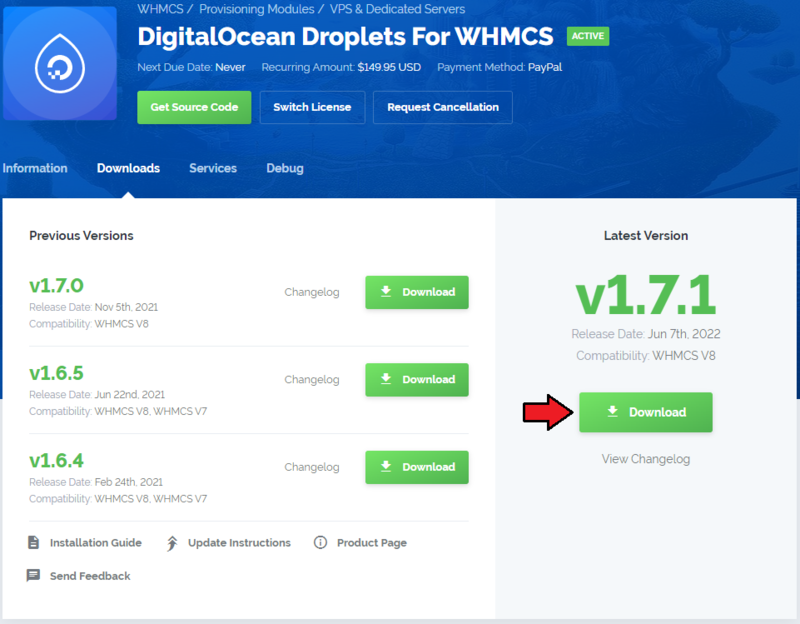 This tutorial will show you how to successfully install and configure DigitalOcean Droplets For WHMCS. 4. 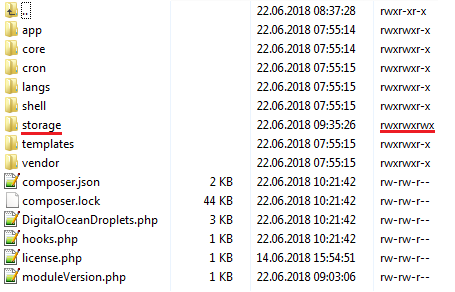 When you install DigitalOcean Droplets For WHMCS for the first time, you have to rename the 'license_RENAME.php' file. The file is located in 'modules/servers/DigitalOceanDroplets/license_RENAME.php'. Rename it from 'license_RENAME.php' to 'license.php'. Enter your license key between the quotation marks as presented on the following screen. 6. Now, set up the 'storage' folder as recursively writable. This folder is available at '/your_whmcs/modules/servers/DigitalOceanDroplets/'. 7. The last step is setting up three cron jobs. Mail cron - will be used to send emails to clients after Droplet creation, rebuilt or password reset. Tasks cron - will be used to remove volumes from the panel after their termination. If not set, the admin will have to delete them manually. Firewall cron - will be used to synchronize Firewalls assigned to Droplets directly in the panel. 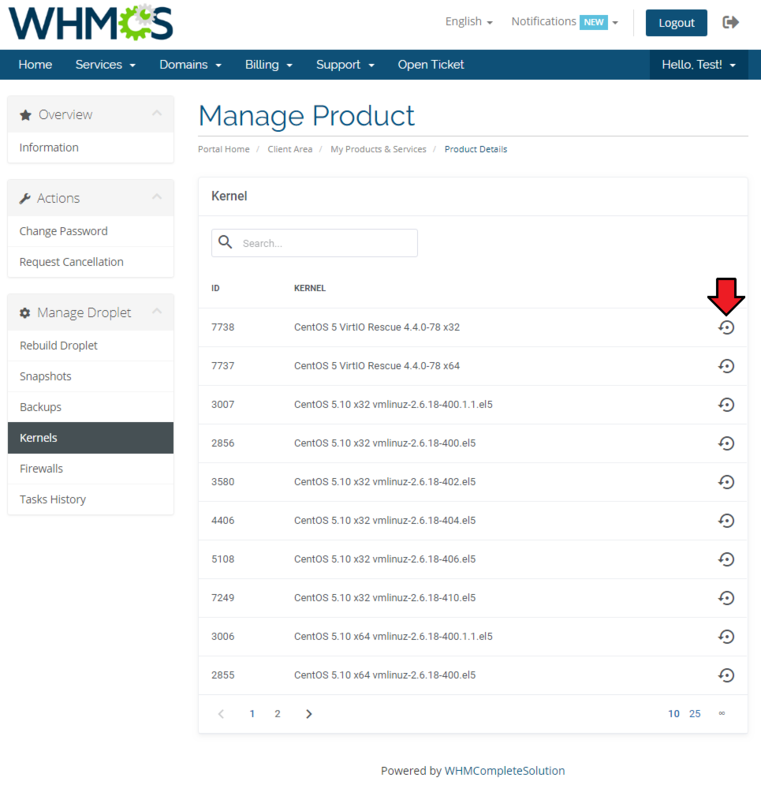 Remeber to replace 'your_whmcs' with your WHMCS root path. 8. Now, we will show you how to configure a new product. 9. 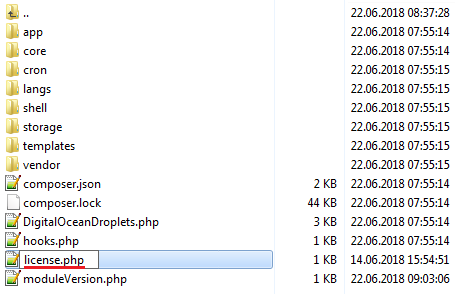 Next, enter your server name and select 'DigitalOcean Droplets' from the 'Type' field. 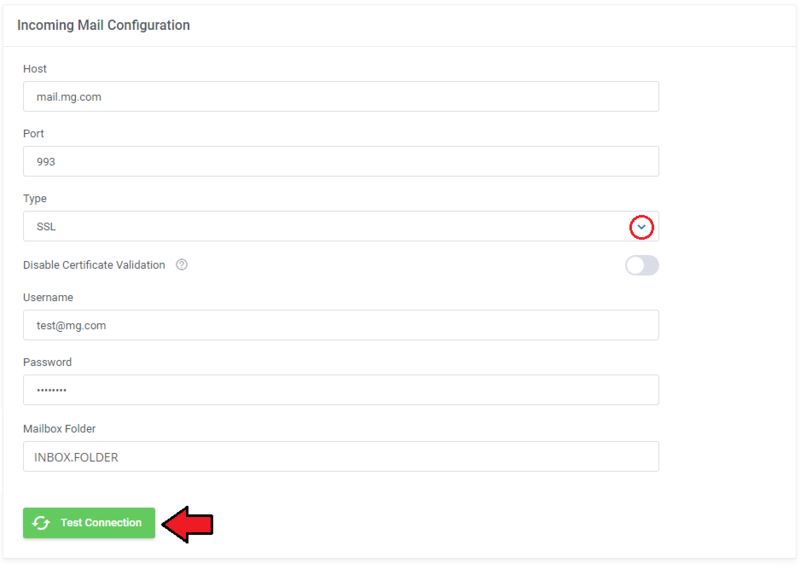 Now, in the 'Password' field provide your DigitalOcean API token and check the connection. If successful, save changes. 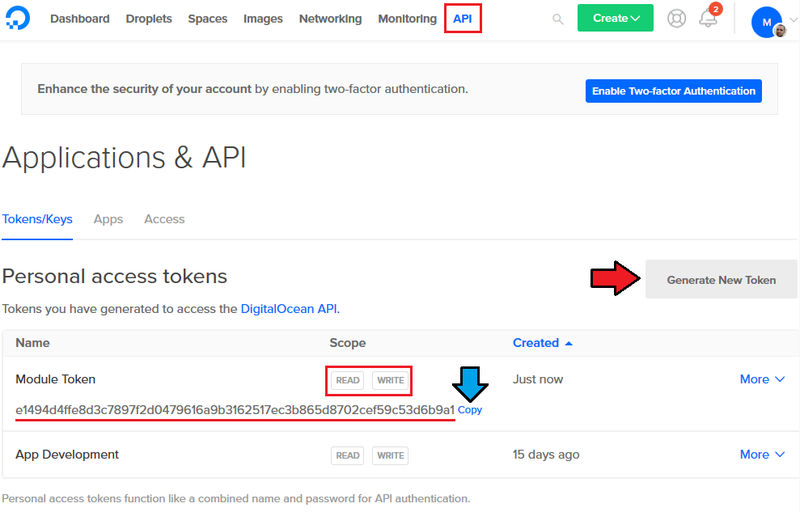 Note: To find your API token, log in to your DigitalOcean panel and go to the API section where you can generate a new token. You will need a token with read and write permissions. Remember to copy and store the token in the safe place because it will no longer be visible in the panel. Click here to see an example where to find it. 10. It is time to create a server group. To do so, click on 'Create Server Group' . 11. Enter a name, click on your previously created server, press 'Add' and afterward 'Save Changes' . 13. 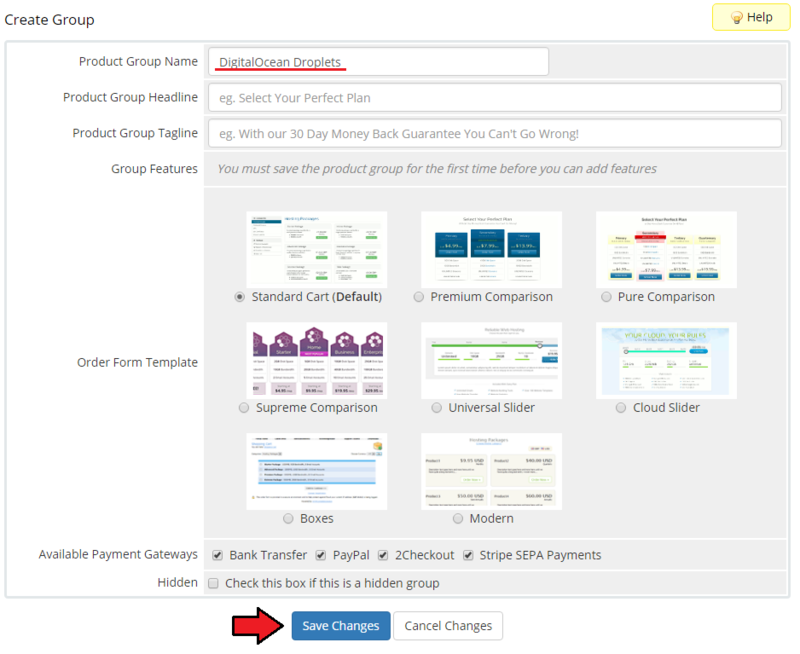 Enter your product group name and press 'Save Changes' . 14. Once you have a product group, you can create a new product. To do so, first click on 'Create a New Product' . 15. Afterward, choose your product type, enter your product name and choose the product group from the dropdown menu. Press 'Continue'. 16. Now, go to the 'Module Settings' section, choose both your previously created server group from the dropdown menu. The module should automatically save and reload the settings. If not, click on the 'Save Changes' option manually. 17. 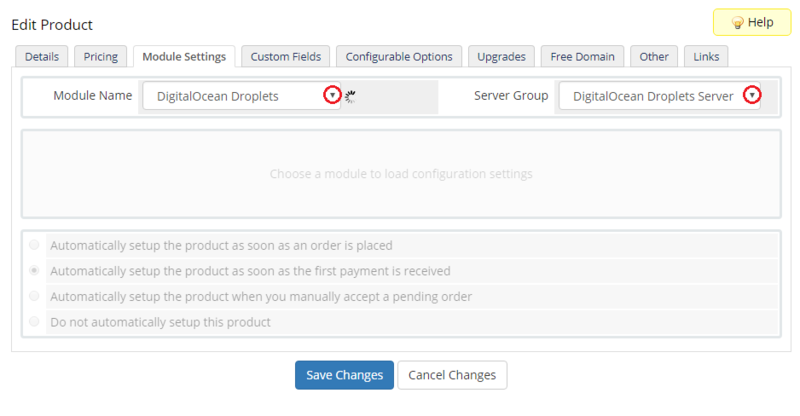 Now, you can start configuring the settings of the Droplet you sell. Project - Select a project on which the droplet will be created. Region - Select the data center region. More distant server locations may increase the server's latency without providing any practical benefits to clients. Size Slug Plan - Choose the size slug plan based on which resources will be allocated to the Droplet. You can read more about size slug indications here. Note: If you want to change their names to more user-friendly, you can do it in a language file. Image - Select the image of the system that will be installed on Droplet. Additional Volume Size - Allows you to create and attach additional SSD storage volume to Droplet in the provided size (in GB). If left empty or set to 0, then the volume will not be created and attached. 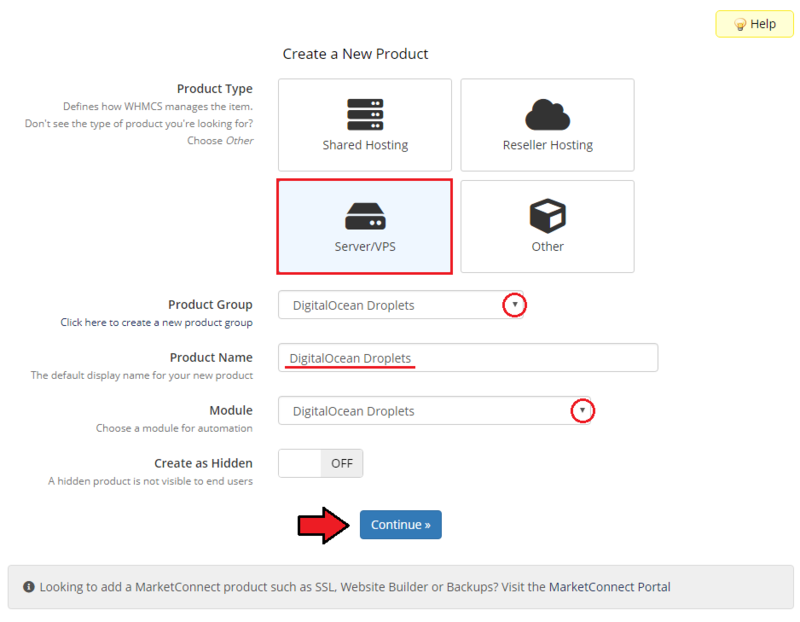 Here you can find more information about DigitalOcean Block Storage. User Data - Choose the execution script which will be used to configure Droplet on the first boot. Go here to find more information about how to use these scripts. Note: User Data scripts are optional for product configuration if you do not want to use them, simply set this field to the 'Do not use' option. Snapshots Limit - Snapshots provide a full copy of a Droplet, saving everything from a Droplet's disk to a disk image. Here you can define the maximum number of snapshots that can be stored at one time. Firewalls Limit - Firewalls block your servers and machines from external attacks. Here you can define the maximum number of firewalls that a client may add per virtual machine. Enter '0' to disable firewalls, leave empty to set no limits. Note 1: You may create more firewalls in the panel which will be assigned with a cron run, the limit in such case can be exceeded. 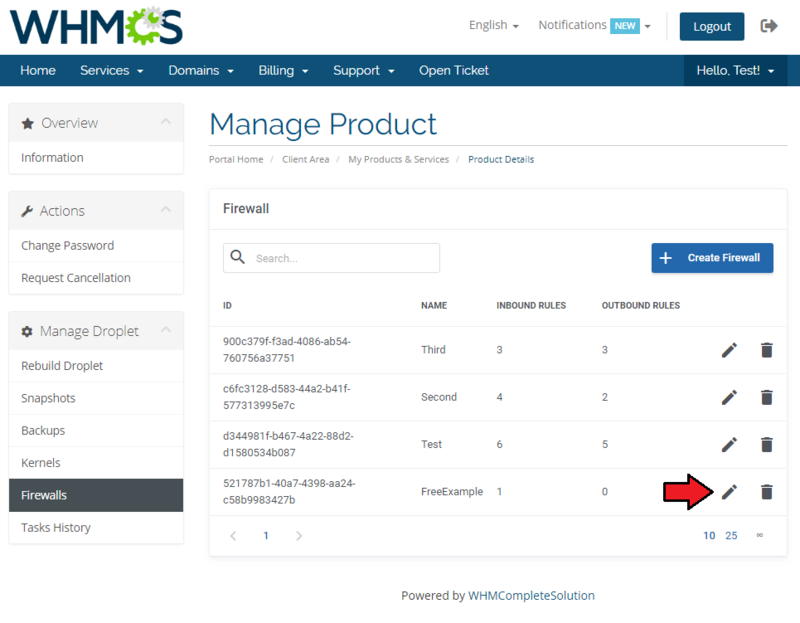 Note 2: A cron command is required to synchronize firewalls assigned and managed in the DigitalOcean Droplets Panel. Tags - Here you can apply custom labels for the Droplet. If you want to add multiple tags, separate them with a comma. Read more about tags here. 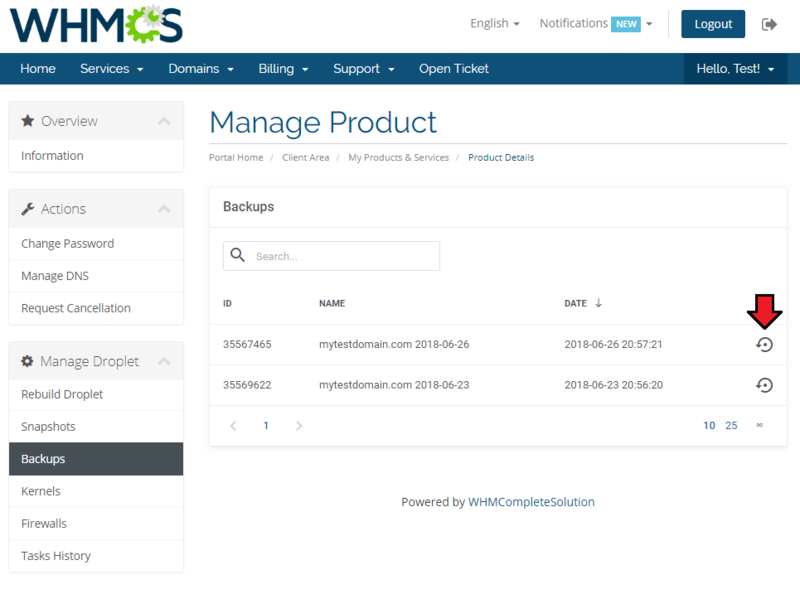 Backups - Enables automatic system-level backups. It can be used for backup images, to revert the server or create new Droplets. Click here for more information. Monitoring - Enables additional Droplet metrics collection, monitoring, and alerting. Here you can find out more. IPv6 - Enables public IPv6 networking for Droplet. Private Networking - Adds Droplet-to-Droplet networking, within the same region. Debug - Enables logging of API requests and responses to WHMCS module log which may be useful if you experience any problems with the module. 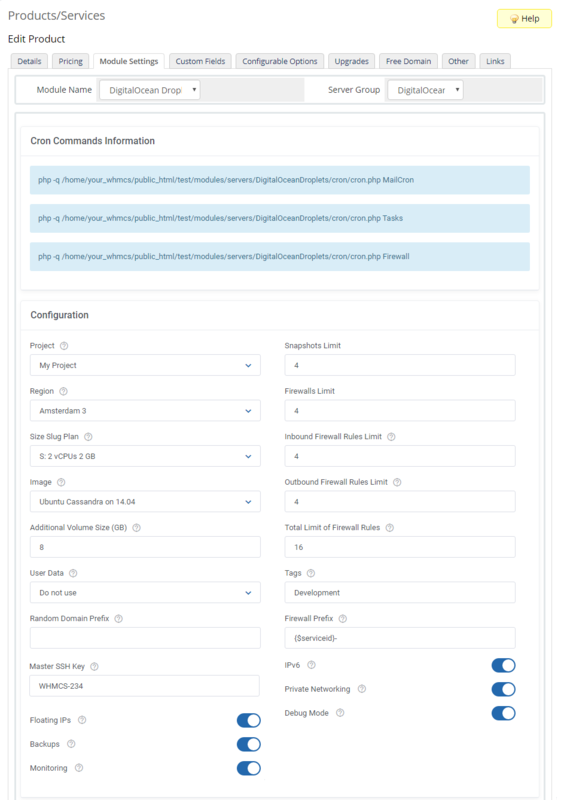 Important: Before providing any extra features to your WHMCS clients, remember to familiarize yourself with the additional costs that may be applied to your DigitalOcean account. 18. Afterward, set up incoming mail configuration. 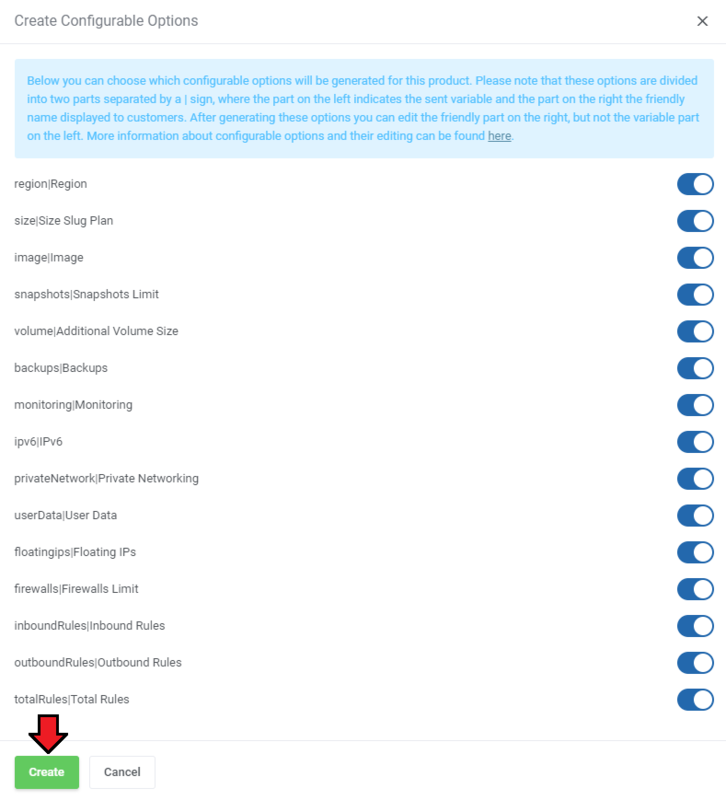 Due to API limitations, all emails with Droplet credentials can only be sent to your DigitalOcean profile email address set in the panel here. This applies to messages with credentials sent after Droplet creation as well as messages sent after password reset. The solution to this problem is email piping that will be used to receive messages sent to your DigitalOcean mailbox and then forwarded through the templates further to your WHMCS clients. Note: Even though the module filters the received messages in your mailbox, we recommend that you use a separate mailbox for your main DigitalOcean profile account to avoid any issues with non-DigitalOcean content. 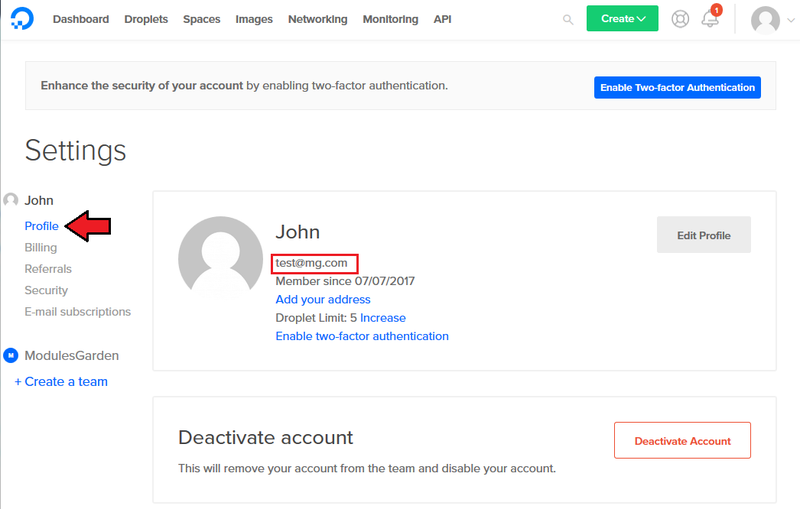 After setting up the dedicated mailbox, provide its valid credentials below and test whether the connection has been established correctly. Note: There is available an option to 'Disable Certificate Validation'. Please toggle this option ONLY if you are having troubles with the connection. The certificate validation will be omitted when connecting to an email box. Once the connection is successful, remember to save your module settings. From now on, the cron set during the last stage of the module's installation should periodically check that mailbox for DigitalOcean messages. If any new emails are received, they will be then converted to your email template and sent to the corresponding client. The default email templates for product creation and password reset can be specified below. Take a look at the Tips section - tip no 4, and check the tempalte content. 19. The following section is dedicated to the Client Area Features. Rebuild Droplet - if enabled, clients are allowed to rebuild their virtual machine in an adequate section. Note: Kernels' management is dependant on the selected OS and must be active in the panel. Before enabling, make sure the option functions correctly in the panel. For more info on Kernels move here. 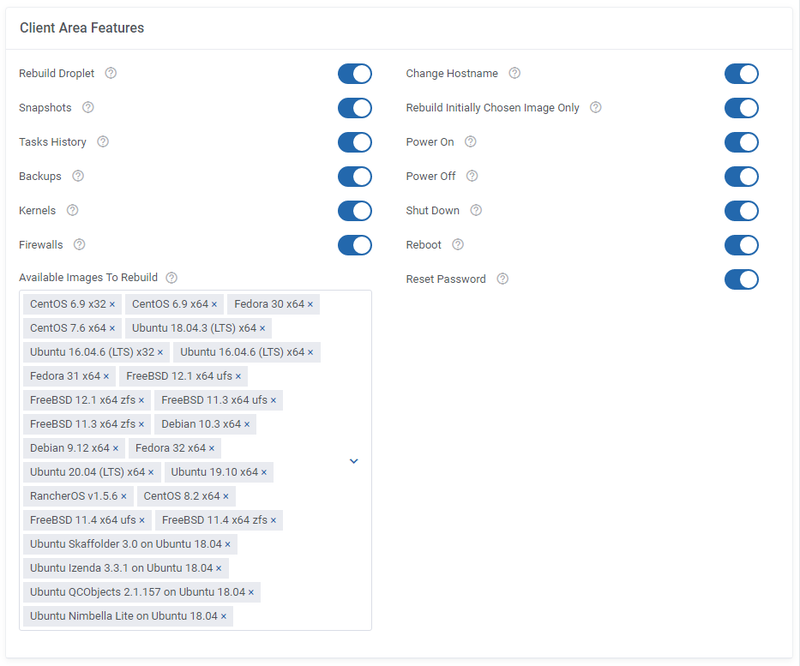 Available Images To Rebuild - Select OS images, One-click apps, and Snapshots from available to allow the client to use when rebuilding a droplet. Please note, that if you leave this field empty then all available OS images and One-click apps provided by DigitalOcean will be displayed in the client area to rebuild except the snapshots. Keep in mind that the available here list of OS Images includes all the snapshots, including the clients' private ones. Be careful when selecting them. 20. At the end of the configuration process, you can decide whether you want to generate configurable options for the product. Configurable options can be used by your clients to select each Droplet parameters individually during order placement. Otherwise, if configurable options are not defined, then the fixed parameters specified in the earlier configuration will be used instead. If you decide to use configurable options, press on the 'Create' button and select which options you want to generate. 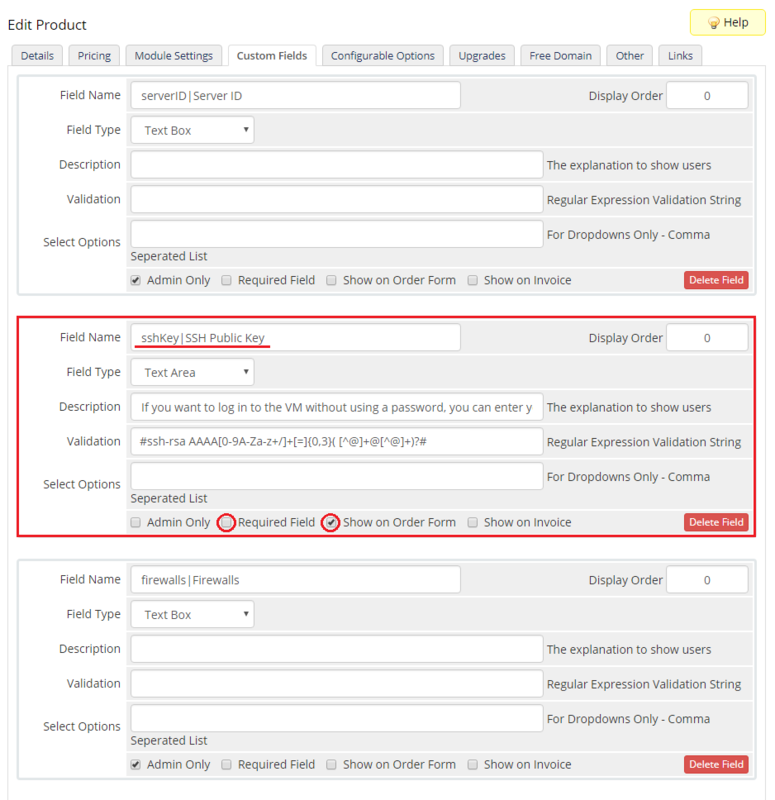 Note that the configuration for disabled options will still be taken from the configuration of the main product. 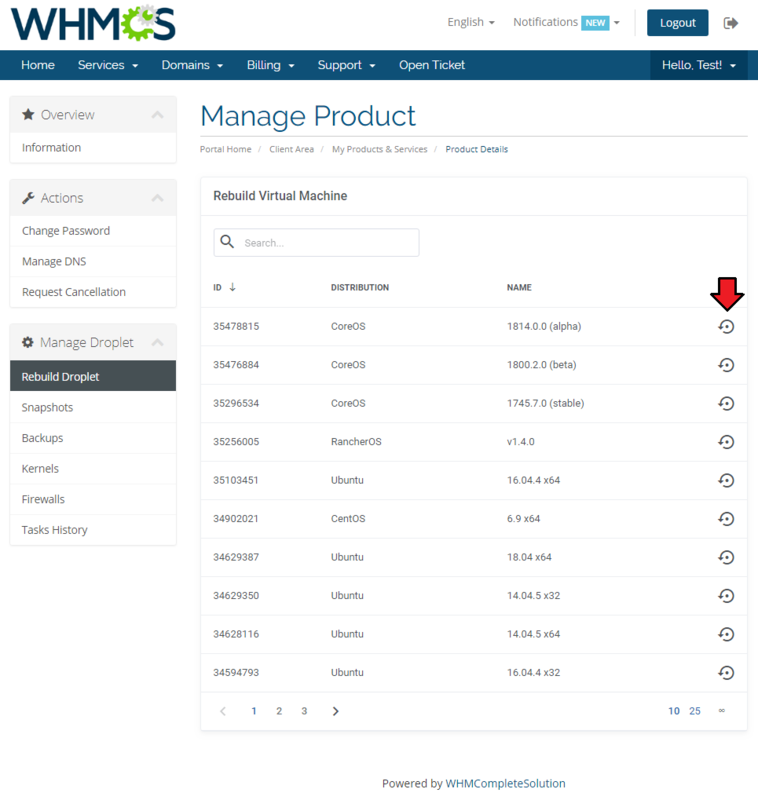 More information about how to use configurable options can be found here or in the official WHMCS documentation. In the 'Custom Fields' tab you will find a 'SSH Public Key' field which is displayed to clients on the order form by default. This field is optional. It allows your clients to insert their public key in order to be able to log in to Droplet without using a password. More information about how DigitalOcean handles SSH keys and how to create them can be found here. If you do not want this field to be available to customers during the ordering process, simply uncheck 'Shown on Order Form' option. Remember that API allows such action only once, during the initial VM creation. Important: During tests we discovered that some OS images such as 'CoreOS', 'CentOS' or 'FreeBSD', may require the SSH key to create a Droplet. In such cases, we recommend that you additionally check the 'Required Field' option for such products. Please also note that when the SSH key is provided, DigitalOcean may not send the welcome email after Droplet creation. User data is arbitrary data that can be executed during Droplet creation, typically during the first boot of a cloud server. This allows you to perform tasks or run scripts as the root user which can be extremely useful when provisioning a server. 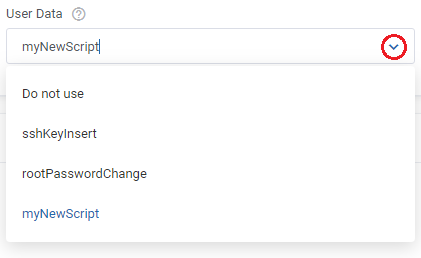 You can provide your own scripts using 'cloud-config' or 'Bash'. By default, we provide two exemplary scripts for changing the OS password or inserting SSH key, which you can use as a reference. The script you want to include has to be located in the '/your_whmcs/modules/servers/DigitalOceanDroplets/storage/userDataFiles/' directory and may not exceed 64 KiB in size. Once you create your own script, it can be chosen for product execution. 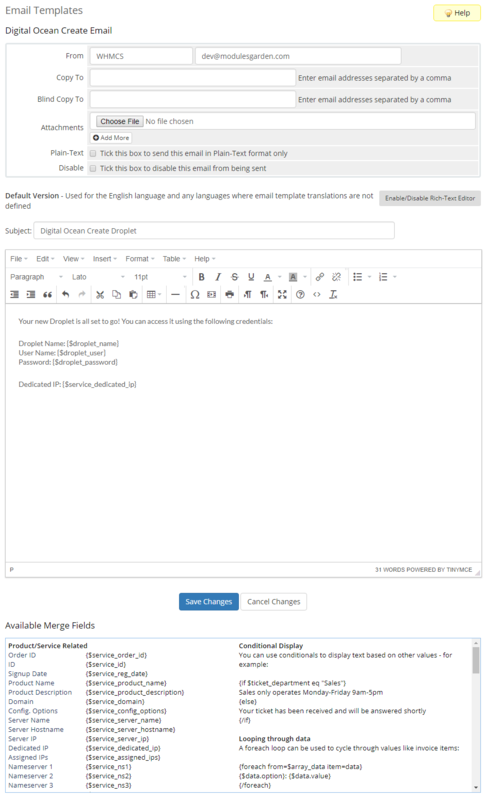 You can provide multiple scripts for configurable options, but only one can be chosen for Droplet creation. If you would like to execute several different scripts at once, you should try combining them within a single file. Remember that the scripts you provide should be compatible with the given distribution. 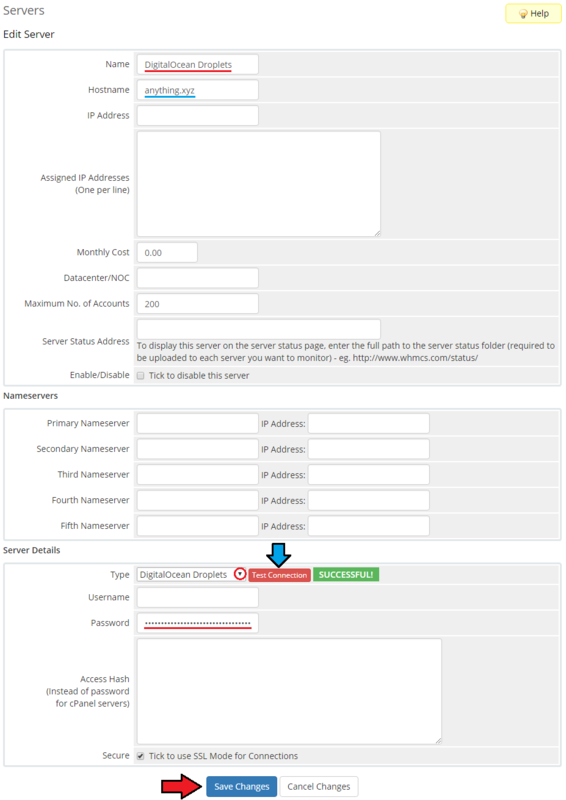 You can learn more here and here about how to use cloud-config for the initial server setup. 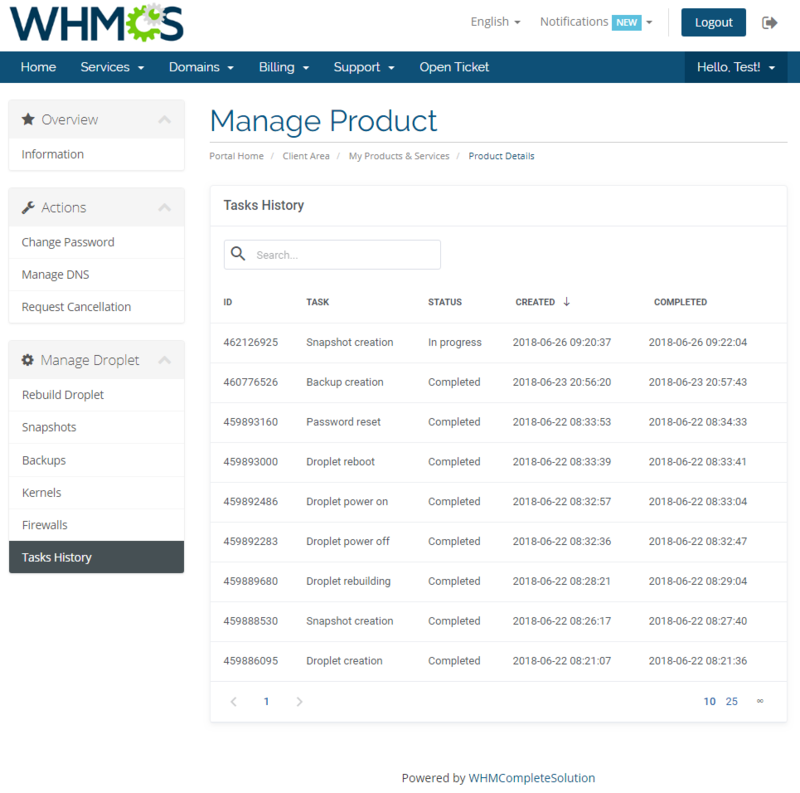 DigitalOcean Droplets For WHMCS allows you to monitor and manage your customer Droplets from the admin area of your WHMCS system. Configurable options which enable you to view the chosen Droplets resources. 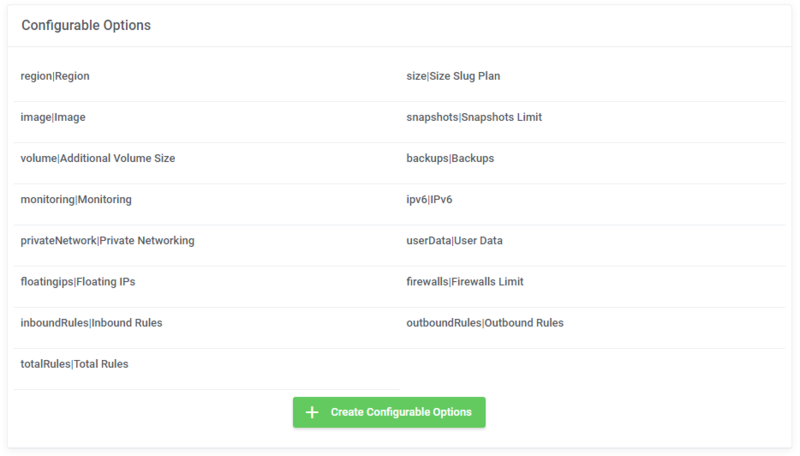 Important: Due to API limitations, the only configuration possible to modify for the already created VM through the 'Change Package' functionality is the 'Size Slug Plan' option for Droplet resizing. And even this action may not always be allowed! You can also change the snapshots limit, which value is only kept locally on the WHMCS server. Module commands, service action and additional options enable you to manage Droplet status and features. Server information provides you with the current status, resources and options set for the Droplet. Network information presents assigned IPv4 and IPv6 addresses to the Droplet along with their gateway, interface type and used netmask or CIDR. You can easily view and make new snapshots of the Droplet. The automatic Droplet backups can be restored here as well. You can also rebuild the Droplet OS to a different distribution. And finally, display all actions taken on Droplets in the tasks history table. Based on the custom SSH key field configuration, you might also insert your public SSH key, which will allow you to log in to a Droplet without the need to use the password. Note that this key should be in one of the OpenSSH standard formats which are supported by API, e.g. ssh-rsa. After the order placement and successful VM creation, the Droplet credentials will be sent to the client's email address according to the set cron execution intervals. Client area interface of DigitalOcean Droplets should look like the one on the screen below. As you can see, the control panel contains useful options required for managing a Droplet. The module allows your customers to easily power on/off, shutdown, reboot and reset password of their servers through pressing the corresponding buttons. Clients can also rebuild the server, create and restore snapshots, create firewalls and manage their rules, access automatic backups and view tasks history with their current status. 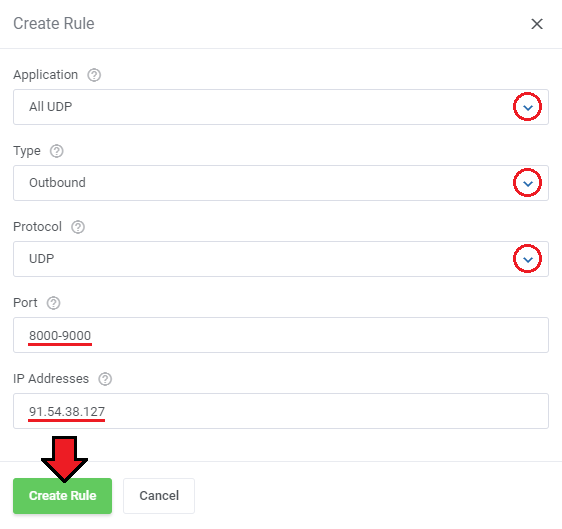 Additionally, clients can change the name of the hostname, view the current Droplet parameters, resources and all set options, as well as the assigned IP addresses. This feature allows your clients to rebuild their virtual machine and change a server's OS image. Press the shown below button in order to reinstall your server to the chosen image and confirm your choice. Please remember that this will also wipe the previously saved data on the VM disk. Use snapshots to save the current contents of the virtual machine memory. You may use them later to restore the VM's settings. Press the 'Create New Snapshot' button and enter the unique snapshot name. Please note that the spaces in the snapshot name will be ignored by the API and saved as a single string name anyway . Creating a snapshot may take a while, so it will not appear on the list right away. Its progress status can be tracked in Tasks History or by refreshing the snapshot list manually. If the automatic backups have been enabled for the Droplets products, then your client will be able to restore them from this section. DigitalOcean uses a snapshot-based backup system. This provides system-level backups of a server without powering it down. Note: This process happens automatically within a pre-determined scheduling window, and is completed in the background while the Droplet is running. Client cannot force the creation of an additional copy on demand or delete it - this however can be achieved by using snapshots feature. In 'Kernels' section you may see kernels available and change your current one. Use the marked on the screen button to upgrade your Kernel. 'Firewalls' section allows to view and create firewalls that will protect your Droplet from external attacks. Press 'Create Firewall' button to create one. Type in the just created firewall a name. A new firewall will appear on the list, note that it will have an ID assigned and a default inbound rule automatically created. 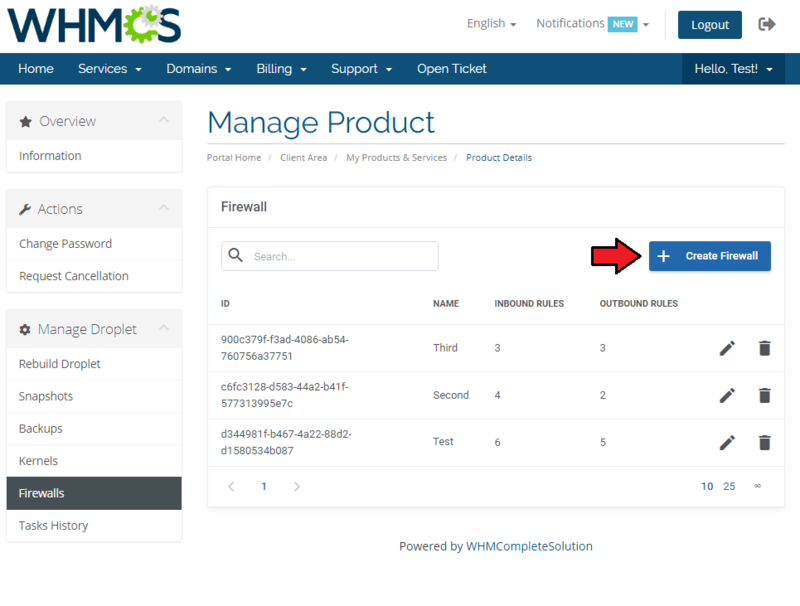 Press 'Edit' icon to move to the firewall rules management page. Every newly created firewall has a default, exemplary rule created. To create your own rules, just click the marked button. IP Address - add IP addresses, use coma to separate. Both IPv4 and IPv6 are supported. Tasks history allows you to view all tasks performed on your VM with the current progress status. Please note that this actions are also collected from the DigitalOcean API. 1. 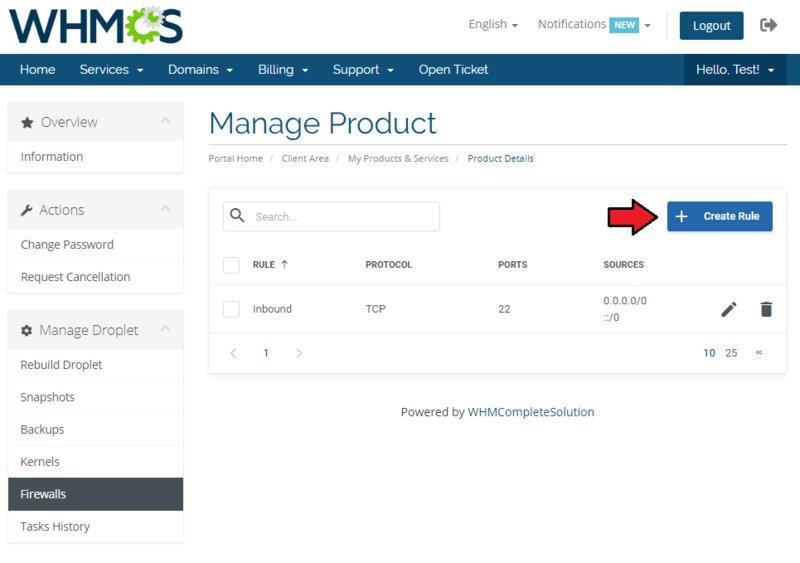 You can use the DNS Manager For WHMCS module to manage your Droplet DNS records. It already has a built-in support for DigitalOcean DNS server. 2. Some of the features like IPv6, private networking or monitoring can only be activated once and cannot be disabled later on. Use these features wisely as they can increase your Droplets maintenance costs. 3. There is an additional custom field named 'Firewalls'. It should be generated automatically when you upgrade the product. In case something goes wrong, please add the custom field manually. Take a look at the screen below to check its specification. Please note that the last merge field has been added into the template in version 1.3.0. In case you started using the module earlier, you may add it manually. Underneath, you can see how the custom template looks like. You may surely edit it at 'WHMCS' → 'Setup' → 'Email Templates'. You will find there the second custom eamil template: 'Digital Ocean Password Reset Email' as well. 2. Certain OS distributions may cause the 'Action did not complete' error in task when trying to reset Droplet's password, even if the success notification is initially returned. This may be caused by the requirement to use the SSH key by given distribution instead of a password. 3. Inserting the SSH key may prevent the welcome email being sent by DigitalOcean after Droplet creation. 4. Some features like monitoring might not be supported by all configurations. Please try choosing for example a different region or distribution. This page was last modified on 18 March 2019, at 15:37.